Preschoolers are too young for many New Year festivities, but they can celebrate a new year safely using these New Year activities for preschool. Use these activities to round out your thematic units! Preschoolers love festivities as much as older kids and adults, but most preschoolers won’t make it to midnight and many New Year’s activities are reserved for the much older. 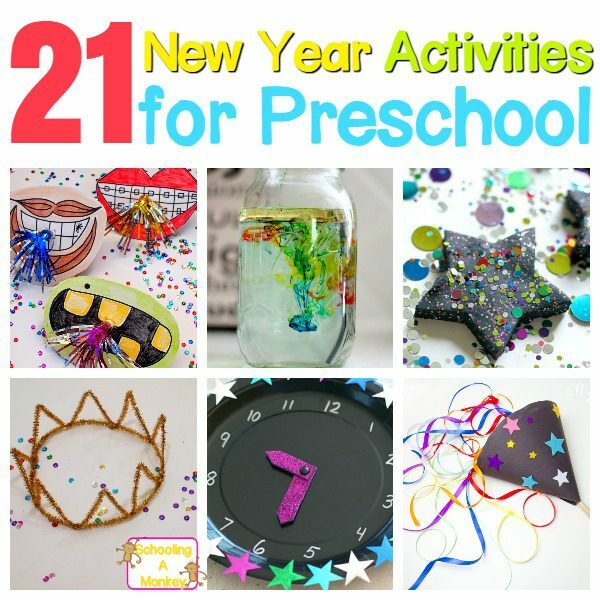 But preschoolers don’t have to miss out on the fun with these New Year activities for preschool! 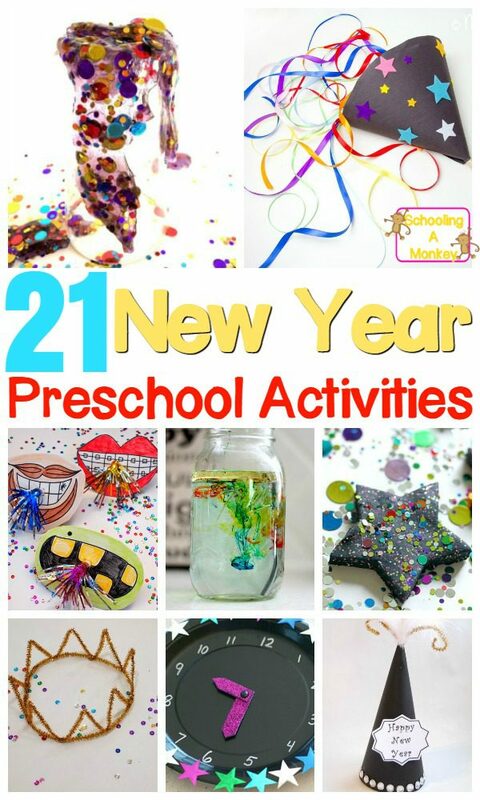 These activity ideas are perfect for New Year’s eve, daycare, the preschool classroom, and homeschool. Even older kids will be delighted with these New Year’s activities. Related: Craft Projects for Kids Anyone Can Do! Make this delightful celebration playdough from Buggy and Buddy. Preschoolers will love making and using this New Year’s countdown clock from Buggy and Buddy. These balloon party poppers from Red Ted Art will be a blast for preschool kids! If you have push pops lying around, make these kid-safe confetti poppers from Schooling a Monkey. You’ll be a preschooler’s best friend when you break out the glitter playdough from Homegrown Friends. Kids will love these glitter star wands from Hello Wonderful. 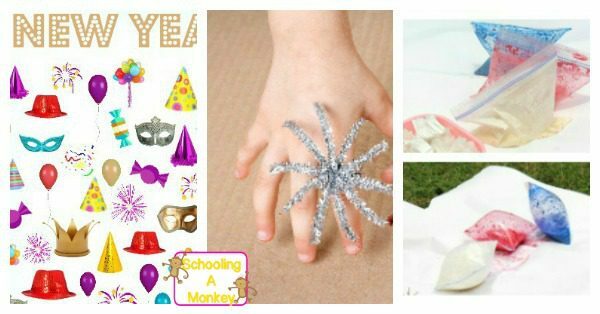 Preschoolers will love making these New Year’s party hats from Meaningful Mama. These silly noisemakers for New Year’s look like giant monster mouths. Get the tutorial from Pink Stripy Socks. If you’re prepared to get messy, these shaving cream and paint fireworks from No Time for Flashcards are the perfect messy play activity for preschoolers. 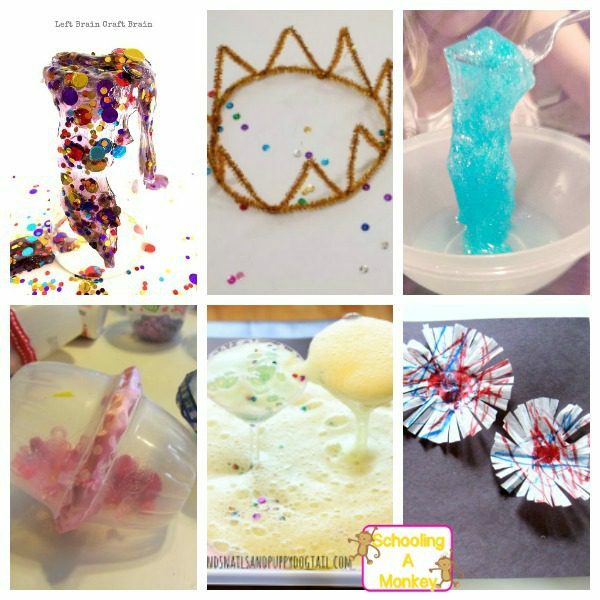 Make preschool-safe sparklers using this tutorial from Kids Craft Room. I Can Teach My Child has a fun activity making fireworks in a jar for kids who can’t stay up until midnight. 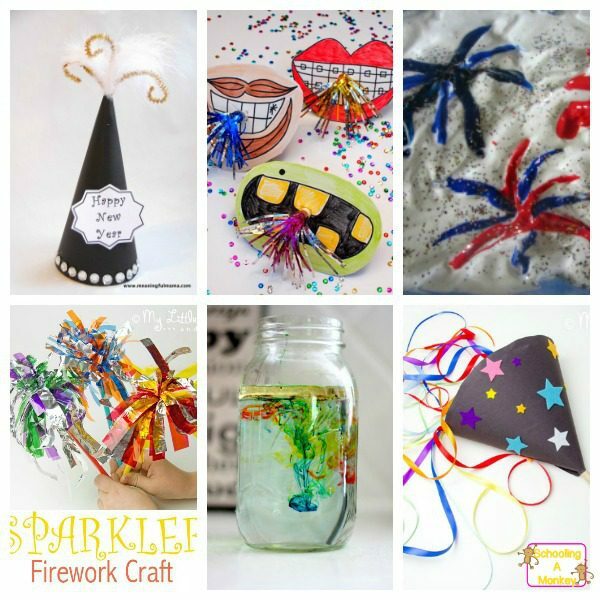 This firework craft is perfect for preschool kids from Kids Craft Room. Glittery, New Year’s slime is such fun for kids to play with. Find out how to make it at Left Brain Craft Brain. Preschoolers will love making these festive crowns to ring in the new year from Pink Stripy Socks. Blue glitter slime is the perfect easy slime for preschoolers to make on New Year’s Day. Find the recipe at Schooling a Monkey. 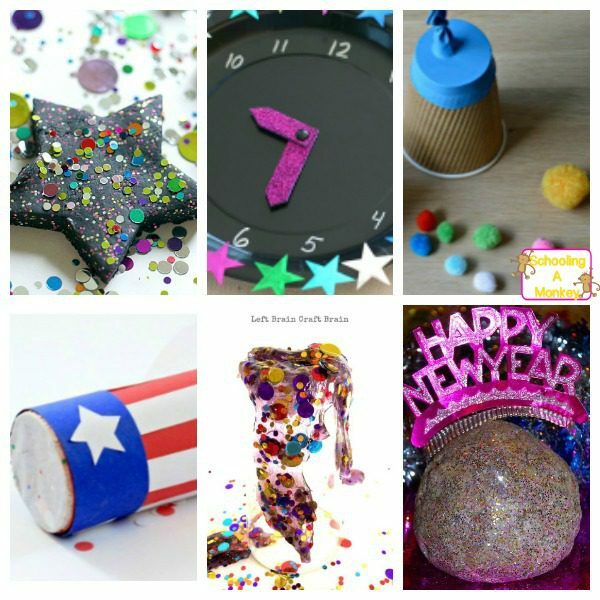 Preschoolers will adore shaking these noisemakers to ring in the new year from Teach Mama. Make erupting New Year’s volcanoes using plastic martini glasses from Frogs and Snails and Puppy Dog Tails. These coffee filter fireworks from No Time for Flash Cards are perfect for preschoolers! Preschoolers will have a blast with the New Year’s eye spy from Simple Play Ideas. These fireworks rings will be a hit with all the preschoolers from Fantastic Fun and Learning. Paint bombs will delight preschoolers and make fun art at the same time! From Schooling a Monkey. « Light Up New Year’s Ball Craft: New Year’s STEM!